I’ll be honest. Books about running aren’t all that exciting to me. It’s not that I think I know everything about it, but I have a penchant for rare and antiquarian titles and that collection on my shelves is about all the reading I have time for. However, when asked if I was interested in reviewing Emelie Forsberg’s publication, I had to say yes, for two reasons. Firstly, I love the sport of Sky Running. The extreme terrain and rawness of the events are awesome. Secondly, I knew that it would be full of epic imagery, which in turns means it wouldn’t be terribly wordy. So as a hardback, ‘Sky Runner’ was going to be a quick and easy read. But while that may have been true, I found myself picking it up several times just to thumb through it again and again, purely for the photos. For those who don’t know who Emelie Forsberg is, in a nutshell I’d say she’s the most well known female name in trail running today. The only person in the sport of any gender that’s more widely recognized is her partner, Killian Jornet. They’re the power couple of mountain running! Emelie was the original flower behind the ear, yoga posing, healthy eating and always positive, social media phenomena in the sport of trail running. Such is her influence, you can see parodies of her all over Instagram today. But to suggest that’s all there is to her, would be an insult. Emelie is a phenomenal athlete. Her exploits in the sport are incredible and include the 2014 Skyrunning World Championship, 2015 Skyrunning World Cup, countless victories in many of the most competitive mountain races on the planet, and FKT’s on Mont Blanc, The Matterhorn and Grand Teton. So we’re talking about one of the most accomplished mountain athletes in the world. Now to the book. The cover sets the scene for what’s to follow. It’s a visual feast, where the imagery sometimes distracts you from the words. I often found myself skipping the text in certain chapters and being content just to look at the photos! But beyond the illustrations, the content itself is pretty darn good. It’s written in a very basic, user-friendly style, so is quite consumable. The chapters are broken up between stories of her running life, which despite her youth is rather extensive, and training advice. 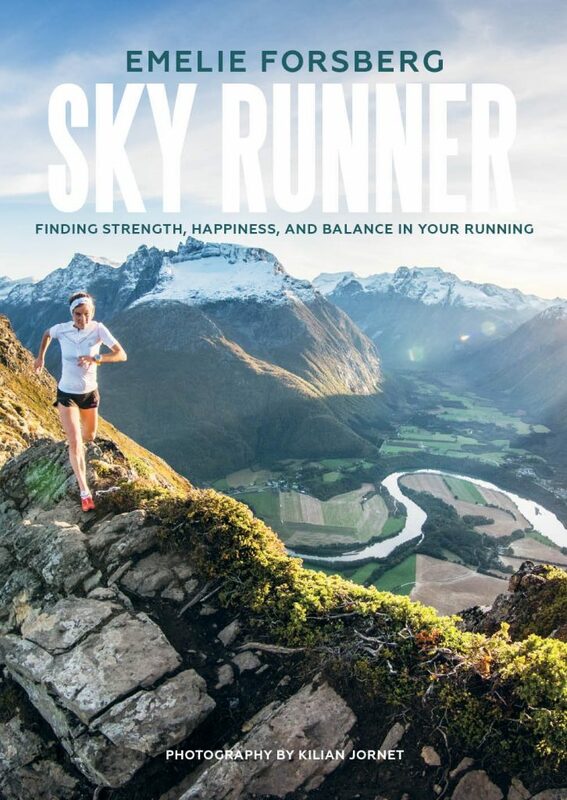 From tales of epic races to personal reflection on life and motivation, Sky Runner provides an insight into how Emelie thinks, feels and achieves the remarkable fetes she has. The training tips are a great addition that those new to trail running can benefit from. The latter chapters include a guide to some basic yoga as well as recipes. As much as I wanted to say “I buy cook books for recipes, and yoga is for hippies!” I actually think what’s in Sky Runner are great additions. These are important parts of her life, so it only makes sense they’re part of the story. Plus, the recipes are bloody good! So if you’re looking for a book to take on holidays or a gift for a trail running friend, I’ll gladly recommend this title. It’s easy to read, has plenty of inspirational imagery, and has some good advice for newcomers to the sport.